For the first time Mercedes-Benz has implemented an all-aluminium bodyshell in a series-production model. Only very few components consist of other materials. The designers use the even lighter magnesium for the cover behind the tank. High-strength steel tubing is integrated in the A-pillars for safety reasons. The new aluminium bodyshell weighs around 110 kilograms less than it would using the steel technology from the predecessor. "The effect is rather as if a heavyweight-class passenger had got out of the car" says Dr Thomas Rudlaff, responsible for the aluminium bodyshell at Mercedes-Benz. "The result is perceptible and measurable. Less weight means more dynamism and less consumption. In other words: the motoring enjoyment increases, the environmental burden sinks." 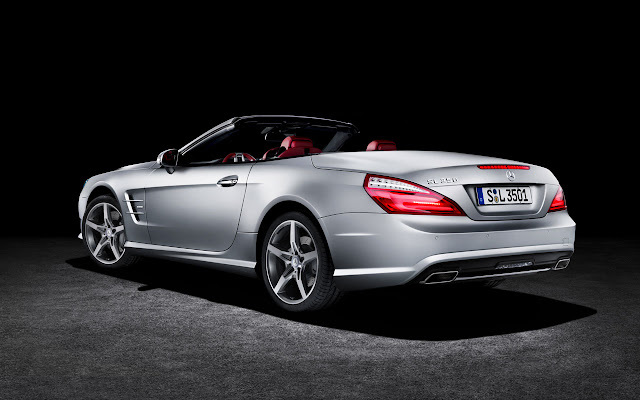 The new V8 in the SL 500 develops 320 kW (435 hp) from its displacement of 4663 cc and thus around 12 percent more than its predecessor despite some 0.8 litres less displacement. The fuel consumption has been reduced by up to 22 percent. At the same time, the torque has increased from 530 Nm to 700 Nm – a gain of 32 percent. Although the displacement remains the same at 3499 cc, the new V6 engine in the new SL 350 develops 225 kW (306 hp) and delivers 370 Nm of torque. It uses just 6.8 litres of fuel per 100 kilometres, making it almost 30 percent more economical than its predecessor. Both engine variants come with a standard-fit ECO start/stop function. The 7G-TRONIC PLUS automatic transmission, which has been optimised in relation to fuel consumption and comfort, also contributes to the exemplary, low fuel consumption. The fuel economy of the BlueDIRECT engines takes nothing away from the roadster's raciness. 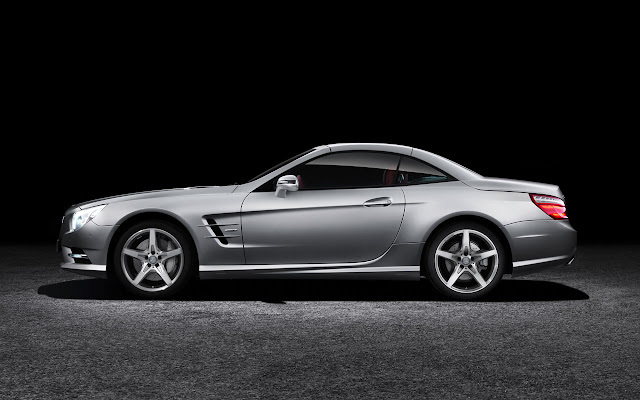 Quite the contrary: the SL 350 accelerates from 0 to 100 km/h in 5.9 seconds, making it three tenths of a second faster than its predecessor. The SL 500 takes just 4.6 seconds – eight tenths less than the previous SL 500. The sixth generation of the SL also offers a vario-roof that can be retracted into the boot using an electrohydraulic mechanism to save space, which converts the SL in a few seconds into a roadster or a coupé, depending on the driver's wishes and the weather. 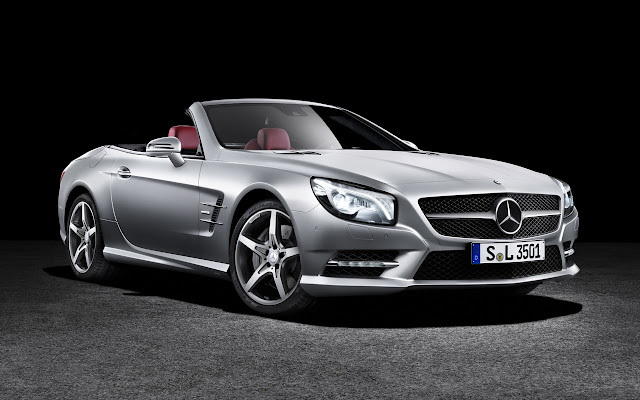 Unlike its predecessor, three versions are available for the new SL: painted, with glass roof or with the unique panoramic vario-roof with MAGIC SKY CONTROL. The transparent roof switches to light or dark at the push of a button. When light it is virtually transparent, offering an open-air experience even in cold weather. In its dark state the roof provides welcome shade and prevents the interior from heating up in bright sunlight. The frame of the three roof versions is made of magnesium, making the roofs around six kilograms lighter than the roof on the predecessor, thus providing a lower centre of gravity for the vehicle and, in turn, better agility. The engineers have refined the operating mechanism for the roof and boot lid. It now takes less than 20 seconds to open or close the roof completely. With virtually no accumulation of dirt on the side windows. MAGIC VISION CONTROL is a new, intelligent and highly efficient wipe/wash system. The innovative wiper blade concept always applies the washer fluid just in front of the wiper blade lip via the channels integrated into the blade – in both directions of wipe. As a result, no water is splashed onto the windscreen during spraying to disrupt the driver's visibility, while at the same time cleaning the windscreen perfectly. The water also remains on the windscreen, thus ensuring it is cleaned without troubling the occupants, even with the roof down. For the first time a fully heated wiper blade is available as an option that prevents snow or ice from forming on the blade in winter. This heating function also allows warm water to be applied directly onto the windscreen for the first time, even in cold temperatures. The likewise unique Frontbass system intelligently uses the free spaces in the aluminium structures in front of the footwell as resonance spaces for the bass loudspeakers. 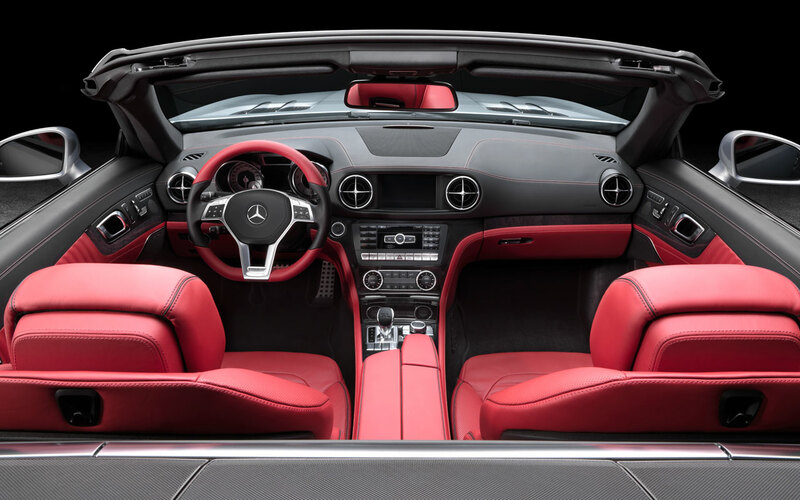 As a result the new SL features clear, crisp bass sounds that make possible a concert hall ambience even with the top down, and frees up space in the doors. Thanks to the crash-optimised aluminium structure, standard-fit PRE-SAFE® and assistance systems on the same high level as the S-Class, the SL is the world's safest roadster. The rigid aluminium bodyshell forms a sturdy passenger compartment along with precisely defined deformation zones in the front and rear ends. In the event of the vehicle overturning, A-pillars made out of a mix of steel and aluminium and two roll-over bars protect the passenger compartment. The restraint systems including the two-stage driver and front passenger airbags have been further developed. A headbag integrally covers the side head-impact area. 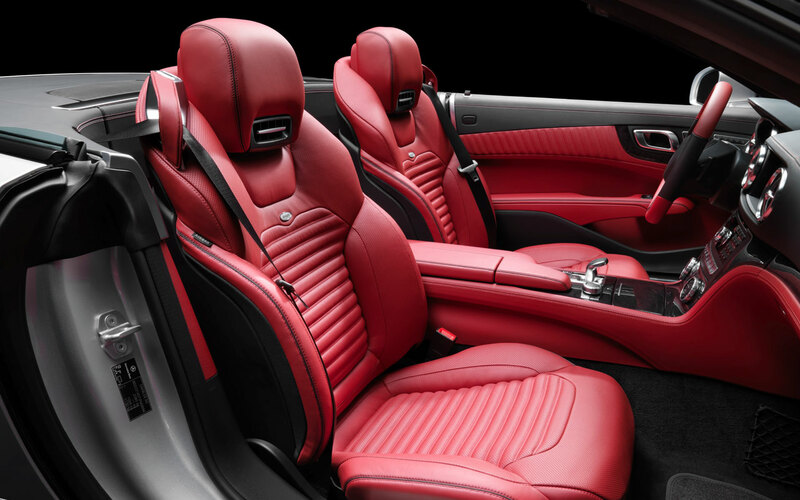 An additional thorax airbag in the seat backrest can protect the upper body in the event of a side impact. Another new feature is the crash-responsive NECK-PRO head restraints developed by Mercedes-Benz which are fitted as standard in the SL. An active bonnet and a front end with a large, yielding impact area help ensure pedestrian protection.